Awards and Recognition — Center for Financial Planning, Inc.
Timothy Wyman, CFP®, JD has been named to the 2019 edition of the 2019 Financial Times Top 400 Financial Advisors. The list recognizes top financial advisers at national, independent, regional and bank broker-dealers from across the U.S. The FT 400 was developed in collaboration with Ignites Research, a subsidiary of the FT that provides specialized content on asset management. To qualify for the list, advisers had to have 10 years of experience and at least $300 million in assets under management (AUM) and no more than 60% of the AUM with institutional clients. The FT reaches out to some of the largest brokerages in the U.S. and asks them to provide a list of advisors who meet the minimum criteria outlined above. These advisors are then invited to apply for the ranking. Only advisors who submit an online application can be considered for the ranking. In 2019, roughly 1000 applications were received and 400 were selected to the final list (approximately 40%). The 400 qualified advisers were then scored on six attributes: AUM, AUM growth rate, compliance record, years of experience, industry certifications, and online accessibility. AUM is the top factor, accounting for roughly 60-70 percent of the applicant's score. Additionally, to provide a diversity of advisors, the FT placed a cap on the number of advisors from any one state that's roughly correlated to the distribution of millionaires across the U.S. The ranking may not be representative of any one client's experience, is not an endorsement, and is not indicative of advisor's future performance. Neither Raymond James nor any of its Financial Advisors pay a fee in exchange for this award/rating. The FT is not affiliated with Raymond James. Any opinions are those of Center for Financial Planning, Inc.® and not necessarily those of Raymond James. Timothy Wyman, CFP®, JD has been named to Forbes 2019 list of "Best -in-State" Wealth Advisors in Michigan, where he ranked 53rd in the state. Forbes aims to spotlight the Wealth Management Advisors who excel in their region and provide resources for markets of all sized concentration. The Forbes ranking of Best-In-State Wealth Advisors, developed by SHOOK Research is based on an algorithm of qualitative criteria and quantitative data. Those advisors that are considered have a minimum of 7 years of experience, and the algorithm weighs factors like revenue trends, AUM, compliance records, industry experience and those that encompass best practices in their practices and approach to working with clients. Portfolio performance is not a criteria due to varying client objectives and lack of audited data. Out of 29,334 advisors nominated by their firms, 3,477 received the award. This ranking is not indicative of advisor's future performance, is not an endorsement, and may not be representative of individual clients' experience. Neither Raymond James nor any of its Financial Advisors or RIA firms pay a fee in exchange for this award/rating. Raymond James is not affiliated with Forbes or Shook Research, LLC. Links are being provided for information purposes only. Raymond James is not affiliated with and does not endorse, authorize or sponsor any of the listed websites or their respective sponsors. Raymond James is not responsible for the content of any website or the collection or use of information regarding any website's users and/or members. Any opinions are those of Center for Financial Planning, Inc.® and not necessarily those of Raymond James. Matthew Chope, CFP® has been named to Forbes 2019 list of "Best -in-State" Wealth Advisors in Michigan, where he ranked 59th in the state. This list aims to highlight Wealth Management Advisors who excel in their region and provide resources for markets of all seized concentration. The Center was named #20 on Crain's Detroit Business Cool Places to Work list. Crain's Cool Places to Work recognition program honors employers that go the extra mile to make employees feel appreciated — as judged by the employees themselves. See more at Crain's HERE. The Center has been named to the Financial Times 300 Top Registered Investment Adviser. The Financial Times 300 Top Registered Investment Advisers is an independent listing produced annually by the Financial Times (June, 2018). The Financial Times FT 300 Registered Investment Advisors 2018 award had about 39.5% of the 760 advisor applicants being recognized as a Registered Investment Advisor. The FT used the database of RIAs who are registered with the U.S. Securities and Exchange Commission (SEC), and selected those practices reporting to the SEC that had $300 million or more in assets under management. Qualifying RIA firms complete an application that gave more information about their practices. That information was augmented with their own research on the candidates, including data from regulatory filings. The FT generated an internal score for each applicant based on six broad factors: advisor assets under management, AUM growth rate, the firm's years in existence, advisors' industry certifications (CFA, CFP, etc. ), compliance record, and online accessibility. AUM comprised approximately 70 to 75 percent while asset growth comprised roughly 15 to 20 percent of each RIA's score. Additionally, to provide a diversity of advisors, the FT placed a cap on the number of RIA's from any one state that's roughly correlated to the distribution of millionaires across the U.S. The ranking may not be representative of any one client's experience, is not an endorsement, and is not indicative of future performance. Neither Raymond James nor any of its Financial Advisors or RIA firms pay a fee in exchange for this award/rating. The FT is not affiliated with Raymond James. For the second year in a row, Nick Defenthaler, CFP® has been named to the Forbes list of “America’s Top Next-Generation Wealth Advisors.” The list, which recognizes advisors from national, regional and independent firms, was released online July 25, 2018. The Forbes ranking of “America’s Top Next-Generation Wealth Advisors,” developed by Shook Research, Data as of 3/31/2018 SHOOK Research considered advisors born in 1980 or later with a minimum 4 years relevant experience. Advisors have built their own practices and lead their teams; joined teams and are viewed as future leadership; or a combination of both. Ranking algorithm is based on qualitative measures derived from telephone and in-person interviews and surveys: service models, investing process, client retention, industry experience, review of compliance records, firm nominations, etc. ; and quantitative criteria, such as assets under management and revenue generated for their firms. Investment performance is not a criteria because client objectives and risk tolerances vary, and advisors rarely have audited performance reports. Rankings are based on the opinions of SHOOK Research, LLC. Neither SHOOK nor Forbes receives compensation from the advisors or their firms in exchange for placement on a ranking. Raymond James is not affiliated with Forbes or Shook Research, LLC. This ranking is not indicative of advisor’s future performance, is not an endorsement, and may not be representative of individual clients’ experience. 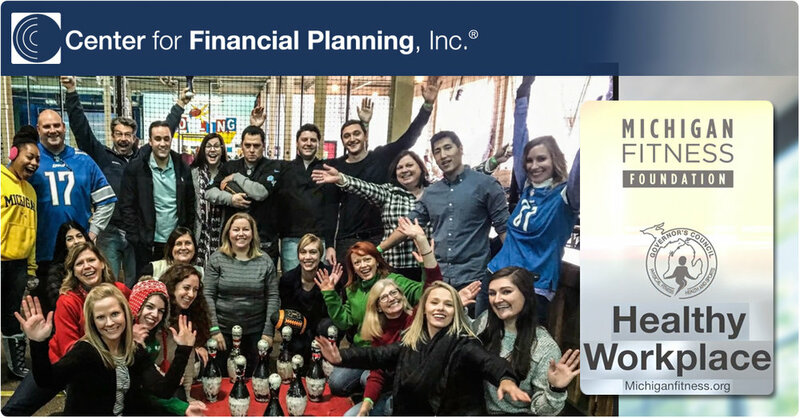 Out of 5,832 advisors considered, 1000 made the final list in 2018.Center for Financial Planning, Inc. is a wealth management and financial planning registered investment advisor located in Southfield, Michigan. Founded in 1985, the firm has ten financial planners and 29 total team members who work with more than 900 clients; the firm manages more than $1.1 billion in assets under management. Securities are offered through Raymond James Financial Services, Inc., member FINRA/SIPC. Investment advisory services offered through Center for Financial Planning, Inc. Center for Financial Planning, Inc. is not a registered broker/dealer and is independent of Raymond James Financial Services. The Center has been recognized as a 2018 Best Places to Work for Financial Advisers as announced by InvestmentNews* today. The Center was chosen as one of this year’s top-50 based on employer and employee surveys delving into everything from company culture, benefits, career paths and more. InvestmentNews partnered with Best Companies Group, an independent research firm specializing in identifying great places to work, to compile the inaugural survey and recognition program. The list is a first of its kind for the financial advice industry. *Source: InvestmentNews “2018 Top 50 Best Places to Work for Financial Advisers”, March 2018. The Best Places to Work for Financial Advisers program is a national program managed by Best Companies Group. The survey and recognition program are dedicated to identifying and recognizing the best employers in the financial advice/wealth management industry. The final list is based on the following criteria: must be a registered investment adviser (RIA), affiliated with an independent broker-dealer (IBD), or a hybrid doing business through an RIA and must be in business for a minimum of one year and must have a minimum of 15 full-time/part-time employees. The assessment process is compiled in a two part process based on the findings of the employer benefits & policies questionnaire and the employee engagement & satisfaction survey. The results are analyzed and categorized according to 9 Core Focus Areas: Leadership and Planning, Corporate Culture and Communications, Role Satisfaction, Work Environment, Relationship with Supervisor, Training, Development and Resources, Pay and Benefits and Overall Engagement. Best Companies Group will survey up to 400 randomly selected employees in a company depending on company size. The two data sets are combined and analyzed to determine the rankings. The award is not representative of any one client's experience, is not an endorsement, and is not indicative of advisor's future performance. Neither Raymond James nor any of its Financial Advisors pay a fee in exchange for this award. InvestmentNews and/or Best Companies Group is not affiliated with Raymond James. Jeanette was recognized at the 2018 Raymond James Financial Services National Conference for Professional Development. The RJFS Outstanding Branch Professional Award is designed to recognize support professionals in RJFS branches who contribute to the success of their advisors and teams. Center for Financial Planning, Inc.® was one of three nominees for the Governor’s Fitness Awards for the healthiest workplaces in Michigan in the small/medium businesses category. Every year, Michigan worksites large and small take that extra step, spend the extra dollar, develop that innovative concept which helps create a healthier workplace - and helps make their employees healthy, fit, and more productive. To honor that commitment, the Governor's Council on Physical Fitness, Health and Sports and the Michigan Fitness Foundation bestow the Healthy Workplace Award on organizations with outstanding programs that help to create best practices for organizations throughout Michigan to replicate. Raymond James is not affiliated with the Governor's Council on Physical Fitness, Health and Sports or the Michigan Fitness Foundation. Timothy Wyman, CFP®, JD has been named to the 2018 edition of the Financial Times 400 Top Financial Advisers. The list recognizes top financial advisers at national, independent, regional and bank broker-dealers from across the U.S.
Six criteria considered include: assets under management (AUM); AUM growth rate; experience; advanced industry credentials; online accessibility; and compliance records. There are no fees or other considerations required of advisers who apply for the FT 400. The FT 400 was developed in collaboration with Ignites Research, a subsidiary of the FT that provides specialized content on asset management. To qualify for the list, advisers had to have 10 years of experience and at least $300 million in assets under management (AUM) and no more than 60% of the AUM with institutional clients. The FT reaches out to some of the largest brokerages in the U.S. and asks them to provide a list of advisors who meet the minimum criteria outlined above. These advisors are then invited to apply for the ranking. Only advisors who submit an online application can be considered for the ranking. In 2018, roughly 880 applications were received and 400 were selected to the final list (45.5%). The 400 qualified advisers were then scored on six attributes: AUM, AUM growth rate, compliance record, years of experience, industry certifications, and online accessibility. AUM is the top factor, accounting for roughly 60-70 percent of the applicant's score. Additionally, to provide a diversity of advisors, the FT placed a cap on the number of advisors from any one state that's roughly correlated to the distribution of millionaires across the U.S. The ranking may not be representative of any one client's experience, is not an endorsement, and is not indicative of advisor's future performance. Neither Raymond James nor any of its Financial Advisors pay a fee in exchange for this award/rating. The FT is not affiliated with Raymond James. The Forbes ranking of Best-In-State Wealth Advisors, developed by SHOOK Research is based on an algorithm of qualitative criteria and quantitative data. Those advisors that are considered have a minimum of 7 years of experience, and the algorithm weighs factors like revenue trends, AUM, compliance records, industry experience and those that encompass best practices in their practices and approach to working with clients. Portfolio performance is not a criteria due to varying client objectives and lack of audited data. Out of 21,138 advisors nominated by their firms, 2,213 received the award. Neither Forbes nor SHOOK receive a fee in exchange for rankings. This ranking is not indicative of advisor's future performance, is not an endorsement, and may not be representative of individual clients' experience. Neither Raymond James nor any of its Financial Advisors or RIA firms pay a fee in exchange for this award/rating. InvestmentNews named the Center for Financial Planning, Inc. a winner of the 2017 Best Practices Awards, an important initiative that recognizes the top-performing and most innovative firms in the financial advice industry. The winners of the InvestmentNews Best Practices Awards were identified through their participation in the 2017 Adviser Compensation & Staffing and the 2017 Adviser Technology Study. *Past performance is not indicative of future results. Individual experiences may vary. The Center was named #13 on Crain's Detroit Business Cool Places to Work list. Crain's Cool Places to Work recognition program honors employers that go the extra mile to make employees feel appreciated — as judged by the employees themselves. The Center has been named #28 in Feedspot Top 100 Wealth Management Blogs. Blogs are ranked based on the following criteria: Google reputation and Google search ranking, Influence and popularity on Facebook, twitter and other social media sites, Quality and consistency of posts, Feedspot’s editorial team and expert review. Raymond James is not affiliated with Feedspot. Center for Financial Planning, Inc.® has been recognized among the nation’s top-ranked investment advisory firms for the past seven consecutive years. Financial Advisor Magazine ranks the top registered investment advisory firms (RIAs) across the country based on a survey of firms’ assets under management and percentage of growth. A total of 638 RIA firms were surveyed and included in this ranking. This ranking is not indicative of future performance, is not an endorsement, and may not be representative of individual client's experiences. No fees were paid to Financial Advisor Magazine in exchange for placement in this ranking. This award is bestowed by an independent third party organization not affiliated with Raymond James. The Center has been named to the Financial Times 300 Top Registered Investment Advisers. The Financial Times 300 Top Registered Investment Advisers is an independent listing produced annually by the Financial Times (June, 2017). The FT 300 is based on data gathered from RIA firms, regulatory disclosures, and the FT’s research. The listing reflected each practice’s performance in six primary areas: assets under management, asset growth, compliance record, years in existence, credentials and online accessibility. This award does not evaluate the quality of services provided to clients and is not indicative of the practice’s future performance. Neither the RIA firms nor their employees pay a fee to The Financial Times in exchange for inclusion in the FT 300. The Financial Times FT 300 Registered Investment Advisors 2017 award had about 41.4% of the 725 advisor applicants being recognized as a Registered Investment Advisor. The FT used the database of RIAs who are registered with the U.S. Securities and Exchange Commission (SEC), and selected those practices reporting to the SEC that had $300 million or more in assets under management. Qualifying RIA firms filled out an online application and questionnaire that gave more information about their practices. That information was augmented with their own research on the candidates, including data from regulatory filings. The FT generated an internal score for each applicant based on six broad factors: advisor assets under management, AUM growth rate, the firm's years in operation, advisors' industry certifications (CFA, etc. ), compliance record, and online accessibility. AUM and asset growth comprise roughly 65 percent to 70 percent of each RIA's score. Additionally, to provide a diversity of advisors, the FT placed a cap on the number of RIA's from any one state that's roughly correlated to the distribution of millionaires across the U.S. The ranking may not be representative of any one client's experience, is not an endorsement, and is not indicative of future performance. Neither Raymond James nor any of its Financial Advisors or RIA firms pay a fee in exchange for this award/rating. The FT is not affiliated with Raymond James. Center for Financial Planning, Inc.® has been recognized among the nation’s top-ranked investment advisory firms for the past six consecutive years. Financial Advisor Magazine ranks the top registered investment advisory firms (RIAs) across the country based on a survey of firms’ assets under management and percentage of growth. This award is bestowed by an independent third party organization not affiliated with Raymond James. The Center has been named to the Financial Times 300 Top Registered Investment Advisers. The list recognizes top independent RIA firms from across the United States. This is the third annual FT 300 list, produced independently by the FT in collaboration with Ignites Research, a subsidiary of the FT that provides business intelligence on the investment management industry. More than 1,500 pre-screened RIA firms were invited to apply for consideration, based on their assets under management (AUM). Applicants that applied were then graded on six criteria: AUM; AUM growth rate; years in existence; advanced industry credentials of the firm’s advisors; online accessibility; and compliance records. Neither the RIA firms nor their employees pay a fee to The Financial Times in exchange for inclusion in the FT 300. Center for Financial Planning, Inc.® has been recognized among the nation’s top-ranked investment advisory firms for the past five consecutive years. Financial Advisor Magazine ranks the top registered investment advisory firms (RIAs) across the country based on a survey of firms’ assets under management and percentage of growth. The Center has been named to the Financial Times 300 Top Registered Investment Advisers. The list recognizes top independent RIA firms from across the United States. This is the second annual FT 300 list, produced independently by the FT in collaboration with Ignites Research, a subsidiary of the FT that provides business intelligence on the investment management industry. More than 2,000 elite RIA firms were invited to apply for consideration based on assets under management (AUM). The 630 RIA firms that applied were graded on six criteria: AUM, AUM growth rate, years in existence, advanced industry credentials, online accessibility and compliance records.